The fire door is a highly engineered construction product that when assembled and installed correctly plays a vital and integral role of the fire strategy within any building. Whilst providing and maintaining fire performance, exterior pedestrian fire doors have to also provide other essential roles including security, thermal performance and weather ability to comply with the Building Regulations. Pyroplex has a long established range of products which have been extensively tested and assessed for use within the Composite Door Market. 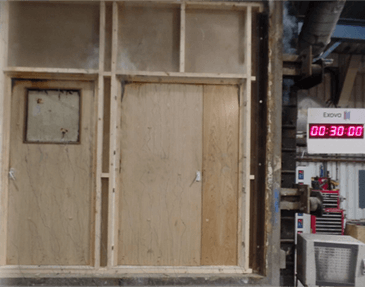 More recently, Pyroplex has worked with HL Plastics, creators of the Liniar brand, to develop a fire sealing solution for its innovative door and window profiles. During the programme, Liniar and Pyroplex worked closely with some of the leading industries component providers such a Distinction Doors, NSG Group, Mila and Yale in the initial concept design and participated in small scale fire testing which was undertaken at Pyroplex. 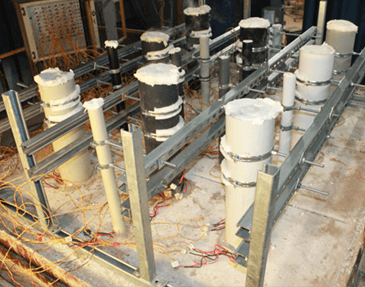 The collective technical expertise from all the various parties involved in the project proved to be invaluable to see the interaction between products when tested for fire resistance, whilst maintaining the other essential characteristics. 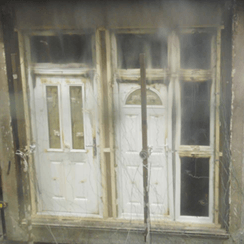 After completing a number of small scale fire tests, Pyroplex commissioned Exova Warringtonfire to undertake a full scale fire test incor porating two doors, both of which included overhead glazing panels and glazed side lights, with large aspect ratios, which can fail under constant fire load. 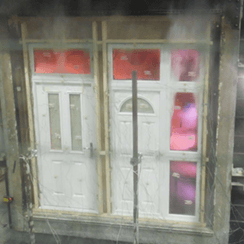 Both doorset assemblies tested, achieved a significant overrun in terms of fire resistance far exceeding the initial expectations. Paul Garforth Technical Manager of Liniar commented “The level of technical expertise and knowledge of Pyroplex has been the key to this success of this testing programme, we have also gained an appreciation of how products perform under fire conditions and we welcome the opportunity to work with Pyroplex in the next generation of our product portfolio”. Pyroplex would like to thank all participants involved in the project, testing and also extended thanks to Stuart Sheerman and his team at Facia Place Limited for their active participation in preparation the test specimens and support in this project.